AFFILIATES DISCLAIMER The Site may contain links to affiliate websites, and we receive an affiliate commission for any purchases made by you on the affiliate website using such links. We are a participant in the Amazon Services LLC Associates Program, an affiliate advertising program designed to provide a means for us to earn advertising fees by linking to Amazon.com and affiliated websites. 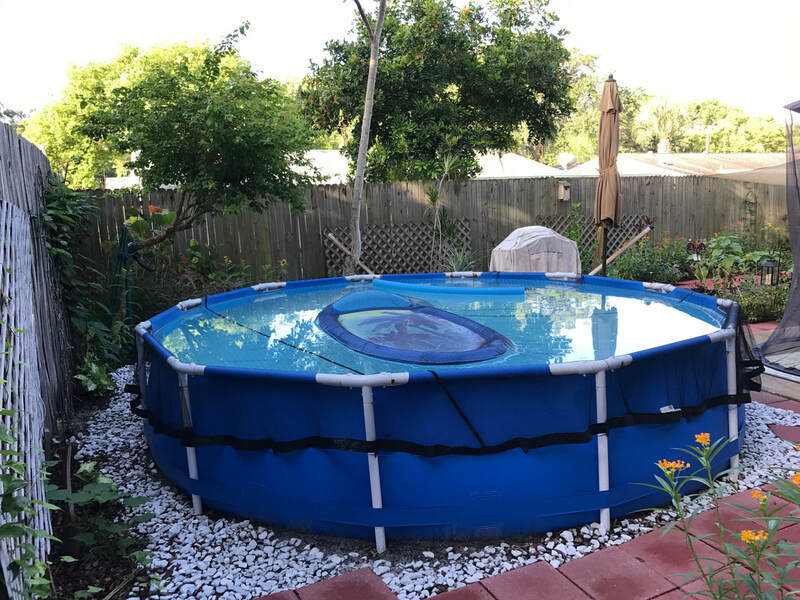 This article supports my Saltwater Pool Setup video to show how you can connect an Intex Saltwater System/Pump Combo (120V Krystal Clear Cartridge Filter Pump & Saltwater System with Electrocatalytic Oxidation) with an Intex 12” X 30” above-ground swimming pool. This article and my video were made because I couldn’t find anything online or at my local pool stores to help me install my small pool with this saltwater system. Most online tutorials and instructions on Intex are for pools larger than 12” X 30”. Those tutorials I found online that included 12” X 30” pools did not demonstrate how to install the Intex Saltwater System/Pump Combo with the smaller size pool. Luckily, I figured it out and after you read this and watch my Saltwater Pool Setup video, you can, too! ​Click here to read my blog on how I used my saltwater pool oasis as part of self-care to feel happy. 1. Prepare for your above-ground pool by finding a level area or leveling the ground in the area designated for your pool. I took time to work on leveling the ground area for my pool because I didn’t have a smooth grass lawn and want my pool to remain year-round. 2. Follow your Intex pool manual for frame set-up details. If more than one person is setting up the pool, start together at one location as you connect the T-joints, horizontal beams, spring pins and vertical legs. After connecting one set of these parts (according to directions in your manual), move together in the same direction and continue around the pool until arriving back at your starting location. For the final T-joint and horizontal beam, lift the parts into the air to allow enough space and flexibility for connecting those parts. Once connected, lower the parts again and connect the vertical leg and final spring pins. Once the pool frame and liner are set up according to your manual’s directions, build a four-inch cove of ground soil or sand around the perimeter of the pool for support and stability. As the pool is filling with water from your garden hose, walk around the inside perimeter of the pool (bare footed) and kick outwardly where a vertical side of the liner meets the horizontal floor liner. If there are two persons setting up the pool, stand facing each other inside the pool perimeter on opposite sides of the pool. Then, simultaneously have both people jump up and kick backwards with both feet at the (opposite) points where the vertical liner meets the horizontal liner. Repeat this action in a few different points within the pool perimeter (always standing opposite one another when kicking out). As the pool fills with water, continue to check that each vertical leg remains vertical (they will shift as the pool fills). When following the Intex Saltwater Pump Combo manual, I discovered an error about where the hose connectors attach. My video and this article clarify the correct way to attach the hose connectors. As shown in my video, the hose connectors from the strainer grids attach to a T-junction. 1. The larger hose connector that comes with the Intex Saltwater System/Pump Combo attaches to that T-junction. 2. The opposite end of the strainer grids’ (adapted) hose connector should attach to the motor housing water outlet of the Intex Saltwater System/Pump Combo. 3. The remaining hose connector attaches to the Intex Saltwater System/Pump Combo electrolode cell water outlet. 4. The opposite end of this hose connector attaches to the plunger valve (Intex part #10747), which is attached to adapter B and the nozzle inlet. Once you have attached the hose connectors correctly, you are ready to start the filter pump. Before plugging in the power cord, open the plunger valve (at the nozzle inlet) by turning counterclockwise and lifting upwards so that air may be released. Loosen the air release valves on the top of the pump and motor housing unit. Lift the hose connector from the nozzle inlet/plunger valve to allow any trapped air to release. Once water begins to flow out of the air release valves, close them by turning clockwise. Now you are ready to plug in the system and turn on the filter. Hold unlock/lock & timer buttons for five seconds until you hear a BEEP. “FP” (filter pump) appears on the LED screen. Add 40 lbs of salt around pool perimeter. Allow the filter pump to run 24 hours. Brush the pool floor to support the dissolving process. Press unlock/lock button until you hear a BEEP. Push timer button until your desired choice of hours to run the saltwater system appears. That’s it! I started my pump early a.m. to avoid peak utility charges and ran it initially for three hours. My chlorine levels were high, so lowered it to an hour. Running only 1 hour left no chlorine. I ran it for two hours for a week and my levels were low. So I keep it at three hours. Just experiment. I get mine tested at a local pool shop to be certain chemical levels are accurate. The Saltwater system and pump starts and stops automatically. However, you should unplug it if it rains. Once you plug it back in, it will resume whatever you previously programmed. ENJOY! The water feels super soft! I created an oasis by setting up a saltwater pool pump in my backyard.